I tried to access YU START but I keep getting an error message or seeing nothing at all. (1) Make sure to check the email you received from York University letting you know when you will have access to YU START. It will not allow you in before your access begins. (2) The following list of programs are eligible for access to YU START. If you do not find your program on the list then you are not eligible for access to YU START. 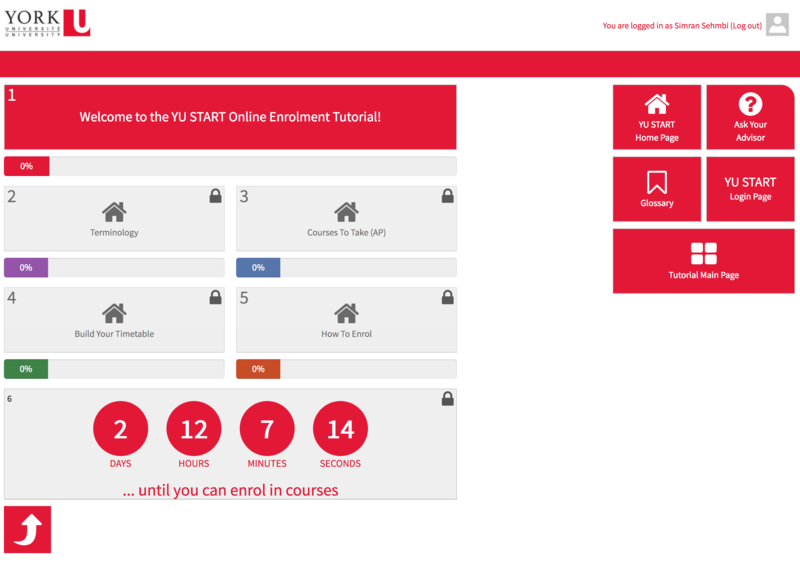 I am in YU START but I can't see the Online Enrolment Tutorial. 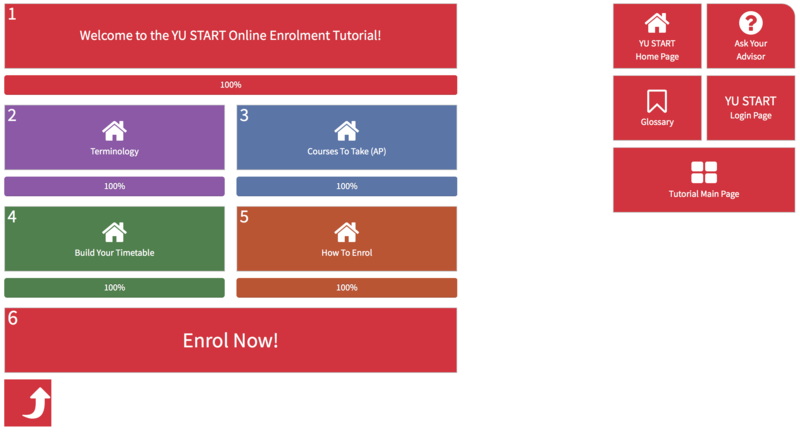 Not all students will use the YU START Online Enrolment Tutorial to Enrol in courses. Below is a list of programs that use the Online Enrolment Tutorial. If your program is not on the list then you do not use the Online Enrolment Tutorial. Set up an appointment with your faculty through MyFile. I am in YU START but most of the content is locked. In order to unlock and view most YU START content, you will need to first enrol in at least one course. If content is still locked after enrolling in a course, please wait 24 hours. If you are still having trouble accessing content, please contact yustrprb@yorku.ca and include your name, student number, a brief explanation of the issue and a screenshot if possible. I've completed my YU START Online Enrolment Tutorial, but I still can't enrol in courses. (2) Take a look at the countdown clock at the bottom of the OET page. This will tell you when you will be able to enrol. (3) If you just completed the Online Enrolment Tutorial, the button already says "Enrol Now", the system may need some time to process your completion. Log out of YU START and try again in 30-60 minutes. If you are still experiencing issues please email yustrprb@yorku.ca, ensure you include your full name and student number along with a brief explanation of the issue and if possible a screenshot and someone will reach out to you. My online enrolment tutorial is showing a program that I'm not in. Please contact yustrprb@yorku.ca and include your full name, your student number and a brief explanation and if possible a screen shot and someone will reach out to you. I'm having trouble seeing some of the videos or activities in YU START. (1) The YU START application is best suited for the latest version of Mozilla Fire Fox or Google Chrome web browsers. Please make sure that you are using the most recent/updated version of these web browsers. Please also ensure these activities are being completed on a computer. (2) Some YU START activites require a Flash Player to run. Ensure you have Flash Player installed and enabled to view all YU START activities & content. Some browsers have the Flash Player installed but not enabled by default. To enable the Flash Player on your web browser, please visit https://helpx.adobe.com/flash-player.html and follow the instructions contained in section 4 to enable the Flash Player on your browser. Please also ensure these activities are being completed on a computer. I paid my enrolment deposit but the Pay Registration Deposit box in YU START is still not checked off. The Pay Enrolment Deposit checkbox will not be updated until early July. If you have paid your enrolment deposit, please go to your Student Account Online Statement (https://sfs.yorku.ca/fees/your-student-account ) or your Financial Institution to confirm. Since the deposit is part of your tuition, it will not appear as a separate charge on your student account Statement. YU START is asking me for my email but I cannot enter my email. (1) It's possible you are trying to access YU START before you have access. Please check the email you received from York University telling you when you would have access to YU START. Once you have entered your email, the YU START application will update with the email that you have provided. Just make sure to log out and log back in. Your student will need to give you access. They can do so in YU START under the 'Add a Parent/Family Member' link in the Pre-Arrival Checklist for New Students. You have not yet confirmed this account. Please return to the email you got from us and click on the confirmation link in that email. Sign Up for York Orientation Day and Visit YU START Here!